Now, you might be asking: why am I so lonely? Well, this article's about cheap snacks, not interpersonal relationships. But Little Caesars did answer a few other questions: How do you make a $7 pizza better? Easy, make its crust out of soft pretzel, and replace the tomato sauce with more cheese. "Better" is a relative term, but the pizza was such a success, loyal sodium lovers demanded the limited-time item come back. And it has. How do you improve that? 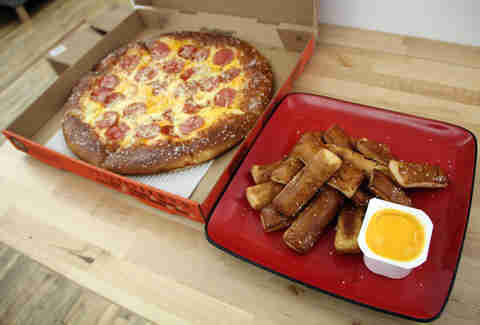 Well, Little Caesar's is throwing in what you really need: a wingman, in the form of Cheese-N-Pretzel Dippers. Little Caesars was kind enough to send samples over to Thrillist HQ so our hungry editors could give the snacks a dip. 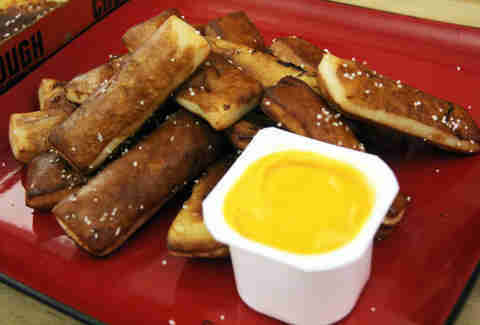 As you'd expect, the pretzel sticks themselves are breadsticks, albeit with a pretzel hue and crust. Rather than getting all burnt-cheesy on the outside, they're soft-pretzel-y. There's not as much texture juxtaposition on the inside to out in these breadsticks as, say, the fare at Auntie Anne's... but, well, that's what Auntie Anne's specializes in. And if you're gonna be competitive at a mall food court, well, you'd better give the kids reason to stray from Orange Julius and double-meat entrees at the Japanese place. While there's a lack of chew, the consistency's not bad or entirely flat. And it definitely tastes like a pretzel, what with its coarse salt dusting. Look! There's me setting up the photo shoot. We're not making all this up. To supplement the carbohydrate vehicle, a dipping sauce labeled "Aged Cheddar Cheese," comes as a catalytic side. It resembles the familiar cheese goop you get with fast food. While water's the no. 1 listed ingredient, aged cheddar cheese (milk, cultures, salt and enzymes) actually ranks as no. 2, so that's surprisingly high in the ingredient hierarchy. Then there's a bunch of oils and other stuff. But honestly, you're not buying pretzel sticks from a place with the slogan "Pizza Pizza" because you're concerned with the health benefits of an orange sauce that comes in a plastic container with a foil lid. You want pretzel breadsticks, you want them with cheese product, and you want them cheap. And that's exactly what Little Caesars gives you. 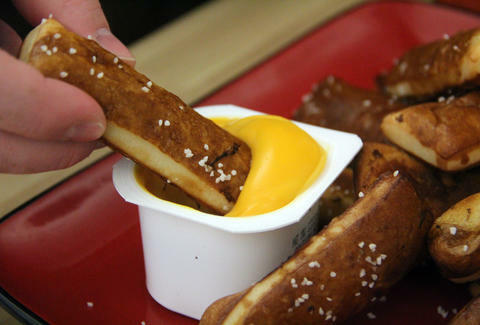 For $3.49, you can get your hands and mouth on Cheese-N-Pretzel Dippers. If you've got $8.49, you have yourself the entire shebang. It's as if a lower-class German woman made sweet, sweet love to an Italian peasant named Caesar, and they had twins. Fraternal twins -- like Julius and Vincent, where the pizza is Julius, and the breadsticks are Vincent. And what a glorious side dish Danny DeVito truly makes. The pretzel breadsticks are alright, too. Ryan Craggs is Thrillist's Senior News Editor. He drank lots of water after writing this article. Follow him @ryanrcraggs.